With veteran Willis McGahee skipping OTAs and Knowshon Moreno being held out while recovering from a knee injury, second-year running back Ronnie Hillman has been running with the first-team offense in Denver. Behind Hillman is rookie running back Montee Ball, who was drafted in the second round (58th overall) out of Wisconsin by the Broncos in April. To help his development, quarterback Peyton Manning has been staying after every practice to work with Ball. 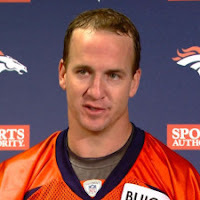 “This is just the start," Manning said after practice at Dove Valley on Thursday. "This is the first couple of practices of OTAs and we still have some time with training camp and then preseason." "You are only allowed a certain amount of time on the field because of the new rules, so [...] I have taken Montee after practice each day and just kind of going through plays, going through games, getting him comfortable hearing audibles at the line of scrimmage." Manning is investing a lot of time in Ball, and for good reason. A consistent rushing attack may be Manning's key to returning to the Super Bowl. The Broncos are hoping Ball can be their man in the near future. "We are going to count on him in a big way this year," said Manning. "He’s a rookie, but Coach (John) Fox is not going to bring him along slowly.